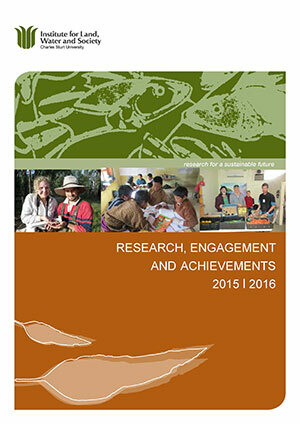 The 2015-2016 report summarises the Institute's research, engagement and activities during those years including for each of the Strategic Research Areas and research themes. It also includes details of members' engagement and linkages at regional, national and international levels. When you look at the combined research efforts of our members as a whole, the breadth, depth and diversity of our research is impressive and substantial. The Institute's performance is on an upward trend. Over the past five years (2011-2015) the Institute secured $10.55M in external research income which represents about 30% of CSU Research Centres' total external income combined over that period. Our publication performance has also improved and in 2015 our share of the total CSU Research Centres' points was 43%. Over a five-year period (2011-2015) the Institute had a total of 455.36 HERDC points, which represents 37% of the total CSU Research Centres' points. The Institute continued to build on its reputation as a leading research provider in Australia and overseas in 2013 and 2014. Several major projects were completed including a number funded by the Australian Research Council, demonstrating the Institute's ability to produce quality research outcomes aligned with its aim. This ability to deliver quality research outcomes was further recognised with the Institute's success in 2014 in securing almost $7M for two new five year projects funded by the Commonwealth Environmental Water Office. The Institute's Strategic Research Areas, first introduced in 2009, have continued to evolve and change with the new Food Security and Regional Australia SRA established in 2014. The collaborative research undertaken by a group of the the Institute's terrestrial ecologists since 2007 was formalised, also in 2014, as a Biodiversity Conservation SRA and includes research -previously reported under the Ecosystems Services SRA. 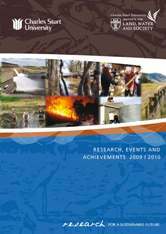 This report highlight's the Institute's research, engagement and achievements in 2013 and 2014 along with detailed reports on each of the SRAs. During 2011 and 2012 the Institute's Strategic Research Areas continue to represent its areas of research strength with a new SRA - Improving Rural Livelihoods and Environments in Developing Countries - established in 2011 and the transformation of the Innovative Perspectives on Energy SRA into the Environmental Justice and Governance for Social Change SRA during 2012. During 2009 and 2010 the Institute's research focus has concentrated on specific research areas - known as Strategic Research Areas (SRAs). These research areas are issue focused, team-based, interdisciplinary, underpinned by disciplinary excellence, and output and outcome orientated. 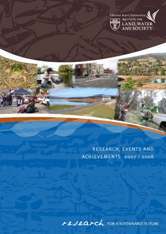 The activities and research of the SRA's are featured in this report, along with summaries of some of the completed and current research projects. 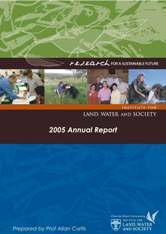 ILWS was established in 2005 with the aim of becoming an internationally recognised research group. Five substantial communities of scholars (Discipline Groups) were established to underpin the integrated research capacity in ILWS. 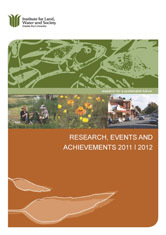 Details on the highlights of this year are found in the report.